Promise Land. God instructs Joshua to have two memorials erected, one on the shore of Gilgal and one in the midst of the river Jordan. 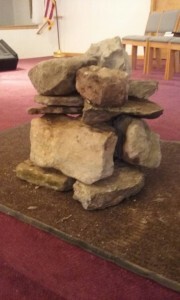 These were established for when their children asked, “What mean theses stones?” the opportunity would be given to “brag-on God” (to tell what God had done for Israel). What mean these stones? these are the past, present, and perpetual promises of God. He sure is GOOD.